I HAVE been asked to tell you about the back of the north wind. Do you enjoy reading children's classics? Or enjoy reading children's fantasy novels? 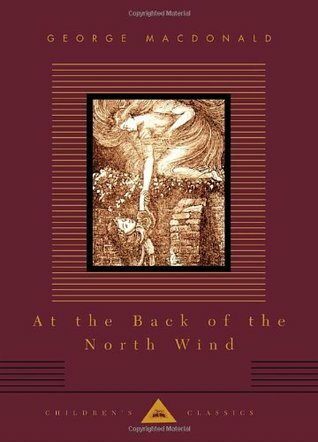 There's a chance that you may love George MacDonald's At The Back of the North Wind. I won't lie. It is a good, old-fashioned story packed with morals and symbolism. So maybe it won't satisfy every single reader. Still there is something about it, even if it is is too wholesome for some. At The Back of the North Wind is Diamond's story. Diamond is a young boy who is completely good and rather odd because of it. He is a bit of an angel, always doing the right thing, always saying the right thing. His intentions are always as pure as can be. But he isn't smug or arrogant. And he does genuinely care for others. So I do not personally see him as being self-righteous or obnoxious. One of Diamond's friends is the North Wind. The first half of the book focuses on this dream-like relationship. At night, he sometimes accompanies her on her journeys. Eventually, he does find his way to the back of the North Wind. The second half of the book focuses on Diamond's family and his personal relationships with his family and friends. The family situation definitely changes throughout the novel. And Diamond's life isn't an easy one. He is an optimist, a dreamer. But the family's struggle is very real and a definite concern to him. One of Diamond's friends is the kind-hearted Mr. Raymond. Mr. Raymond has a heart for children, especially for poor ones, and he does what he can to help everyone. He is also a story-teller. I LOVED, LOVED, LOVED Mr. Raymond's story called "Little Daylight." Even if you're not interested in reading the whole novel, even if it doesn't sound like your kind of book, you should make time to read this one stand-alone chapter. Especially if you LOVE fairy tales. (And who doesn't love fairy tales?!) I think Little Daylight would make a lovely picture book adaptation. So I definitely enjoyed this one. Perhaps not as much as The Light Princess. But at least as much as the two Princess books (Princess and the Curdie, Princess and the Goblin). "Oh yes, it will," answered Diamond. "I am all right now—quite comfortable, I assure you, dear North Wind. If you will only let me stay here, I shall be all right indeed." "You never made that song, Diamond," said his mother. "No, mother. I wish I had. No, I don't. That would be to take it from somebody else. But it's mine for all that." "Does loving a thing make it yours?" "I think so, mother—at least more than anything else can. If I didn't love baby (which couldn't be, you know) she wouldn't be mine a bit. But I do love baby, and baby is my very own Dulcimer." "That makes her the more mine, mother." "Is that because you love me?" "Yes, just because. Love makes the only myness," said Diamond. "And can you always tell why you like it or not?" "No. Very often I can't at all. Sometimes I can. I always know, but I can't always tell why.